Not long after I got my first "good" telescope, my 8-inch Criterion RV-8 Dynascope Newtonian reflector, as my Christmas gift in 1971, I became fascinated with the Perseus Galaxy Cluster. One reason I am so fond of this collection of more than 500 galaxies is that the cluster grows as the telescope's aperture increases. Small backyard scopes will show the two big kids on the block, NGC 1272 and NGC 1275, but even the largest amateur instruments fail to show all of the "little guys." Also known as Abell Galaxy Cluster 426, the Perseus Galaxy Cluster lies close enough to the plane of the Milky Way that the surrounding field is strewn with nearby stardust, which creates a very pretty overall effect. There are plenty of hidden treasures scattered throughout cluster's full 190' expanse. How many can you pick out in your telescope? At about 230 million light years away, the Perseus galaxy metropolis is easy to find just 2° east-northeast of the Demon Star, Algol [Beta (β) Persei]. The brightest of the bunch, NGC 1275, shines at about 12th magnitude and lies just 2' east of an 11th-magnitude field star at the heart of the cluster. 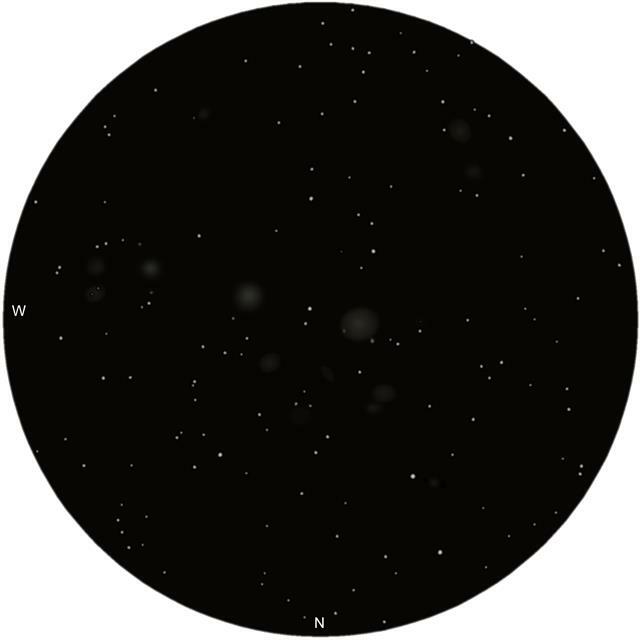 Through your telescope, as through my 10-inch, NGC 1275 will look like a small, slightly elliptical glow that is punctuated by a bright stellar core. When we gaze upon that small blemish, we are seeing a seething system in uproar, a galaxy that is emitting tremendous amounts of X radiation. The full story behind NGC 1275 was first unveiled in 1943, when Carl Seyfert included it in his list of galaxies with active nuclei. NGC 1275 is also included as 3C 87 in the Third Cambridge Catalog of quasars and radio sources, published in 1959 (revised in 1976). And not just any radio source, mind you, but the second strongest in the entire sky -- only Centaurus A (NGC 5128) is stronger. Studies now reveal that filamentary jets of material are erupting from the core of NGC 1275 and discharging into space at greater than 5.3 million miles per hour (2,400 kilometers per second). Hubble images reveal what the fuss is all about. We are not looking at one galaxy when we view NGC 1275; rather, we are looking at two separate galaxies that are intimately embraced by gravity. Photographs clearly show the disrupted disk of a dust-laden spiral galaxy cutting through a large elliptical galaxy at speeds approaching 7 million miles per hour (3,000 kilometers per second). In the process, gravitational tidal forces distort each galaxy, compressing huge clouds of interstellar matter and triggering new star formation. 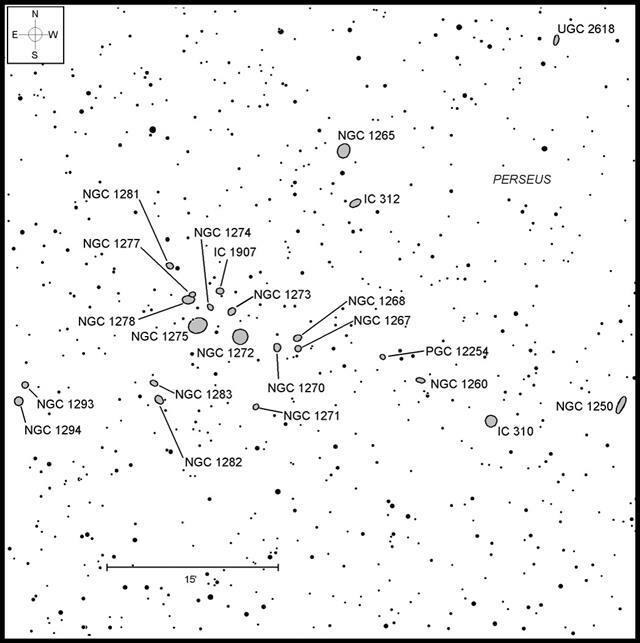 After NGC 1275, the next brightest member of the Perseus clan is NGC 1272. You will find it just 5' to the west. Although NGC 1272 is listed at visual magnitude 11.7, you may feel, as I do, that its surface brightness is at least a full magnitude lower. My most pleasing view of NGC 1272 through my 10-inch is at 106x. Above: Sketch of the central portion of AGC 426 through the author's 18-inch (46cm) refractor. Compare this view to the chart above, noting the flipped orientation. NGC 1275 is the largest galaxy, seen right of center, while NGC 1272, at number 2, is left of center. While its magnitude is only 13.2, NGC 1273 is actually easier to see than NGC 1272. The difference is in the apparent size. NGC 1273 is only half the diameter of its larger, but dimmer neighbor. The resulting higher surface brightness (magnitude 12.5 versus 13.5) helps to make this little spiral an easier catch than the larger elliptical. All three galaxies form a triangle at the center of the cluster. A fourth very faint, distended patch of light actually turns that triangle into a parallelogram. This dimmest member of the four is actually two galaxies, NGCs 1277 and 1278, separated by less than 50". By increasing magnification to around 175x and waiting for steady seeing, both should be distinguishable as individual objects, with larger and brighter NGC 1278 lying southeast of NGC 1277. In between NGC 1278 and NGC 1273, just 2.7' northwest of NGC 1275, is NGC 1274, a tough test indeed. Notes made through my 13.1-inch (33.2cm) at 125x recall simply a very faint, very small blur. NGC 1270 lies further southwest of NGC 1272. That same night through my 13.1-inch, I recorded it as a "dim, poorly concentrated glow." To its west are NGC 1267 and NGC 1268, a pair of even fainter challenges. See that 10th-magnitude star 7' north of NGC 1275? Look just 1' to its east for dim NGC 1281. Can you spot it? Seeing its tiny disk, which measures just 0.9'x0.4' across and shines at magnitude 13.3, is tough enough, but the scattered light from that star can really get in the way. If you have an eyepiece with an occulting bar, you might give it a try here. Once you conquer the galaxies described above, branch out on your own to find even more. The table below lists all of the galaxies in AGC 426 that are brighter than magnitude 14.5, which is a reasonable cut-off point for 10- to 14-inch telescopes, while the chart plots the cluster's population center. As you can see, there are plenty of other, mostly smaller and fainter systems, waiting for you. On the bucket list - yes, I have a Sky Safari list appropriately labelled "Bucket List"! 500 galaxies...what did I do to you, Phil? Are you trying to kill me via sleep deprivation? Oh well, I guess there are worse ways to go than seeing how deep one can peer into an Abell Galaxy Cluster. Thanks for the article, I suppose I need to start marking up that A4 Uranometria chart so that I am ready to go really deep. Kudos for listing v, b, and p where known. V is often 0.5 to 1.0 mag brighter than b or p so this can have substantial impact on visibility for those with smaller scopes and/or in poorer skies. And now this, just when I thought knocking off 60 of M31's globular clusters in one night with the 17.5" was a nice accomplishment. Turns out that was just a drop in the bucket (list). The last time that I observed A426 was on the night of November 24th. I had a brief look at the center of the cluster through a 25" Obsession Dob belonging to a fellow CAS member. I would have tried to do a better count than I did but the position I was in on the ladder was a bit uncomfortable. My favorite galaxy cluster. I observed it last on December 9th at Lake Sonoma. Unfortunately, transparency was not great but at least half a dozen galazies were visible in a 34' field at 250X. I've much better views at Shot Rock (7650 ft. altitude and a dark sky), but that's snowed in as far as I know. Great choice! I've seen some of the brighter members through my old 6" f/8 A-P refractor, but for some reason, I've never turned my 12.5" Dob. toward it. My club recently took delivery of a 30" f/3 (f/3.5 with Paracorr) Starstructure with a Lockwood mirror. This cluster is one of the "objects" I want to see through this scope, but in my neck of the woods, lake-effect cloud cover is in play from Oct. through April, with clear skies quite rare. We'll see. I keep coming back to this one an hour or two every other session. 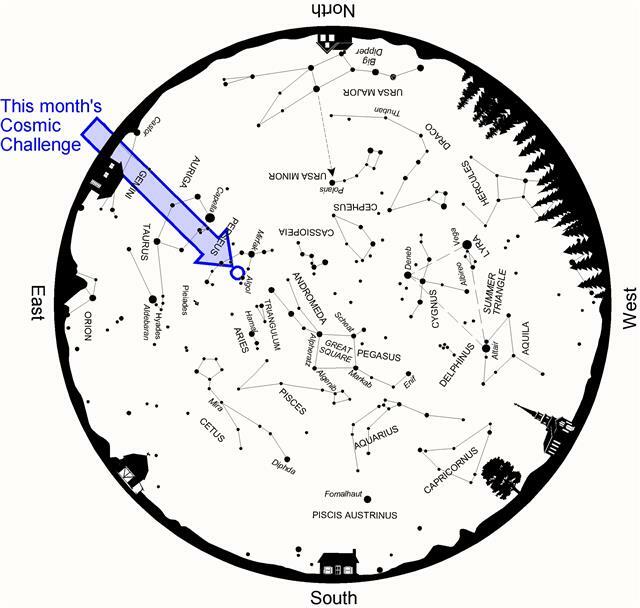 I keep adding more to look for in the big circle of the A4 Uranometria chart based on survey images. I have logged 122 so far and have dozens more plotted to search for...and more areas that I need to check in the survey to go deeper. I don't know that I will finish it this winter, the site I use has some trees that cut short observing in that direction.